Wednesday November 29th 1922 Did ironing, put up clean curtains and fixed my room in AM. Went to town in PM. Found Ivy Webster had gone home. Then went to cemetery. Home in taxi. wrote Laura and Mattie Stitt. 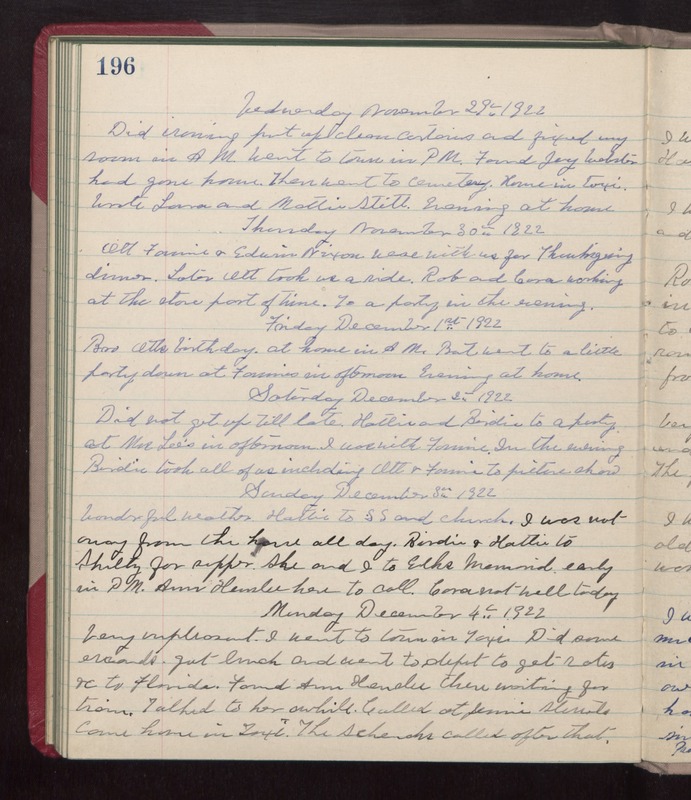 Evening at home Thursday November 30th 1922 Ott, Fannie & Edwin Nixon were with us for Thanksgiving dinner. Later Ott took us a ride. Rob and Cora working at the store part of time. To a party in the evening. Friday December 1st 1922 Bro Otts birthday. At home in AM. But when to a little party down at Fannies in afternoon. Evening at home. Saturday December 2nd 1922 Did not get up till later. Hattie and Birdie to a party at Mrs Lees in afternoon. I was with Fannie. In the evening Birdie took all of up including Ott & Fannie to picture show. Sunday December 3rd 1922 Wonderful weather. Hattie to S S and church. I was not away from the house all day. Birdie & Hattie to Shultz for supper. She and I to Elks Memorial \in PM. Anna Henslee here to call. Cora not well today. Monday December 4th 1922 Very unpleasant. I went to town in Taxi. Did some errands. Got lunch and went to depot to get rates &c to Florida. Found Ann Henslee there waiting for train. Talked to her awhile. Called at Jennies Sterrets. Came home in Taxi. The Schencks called after that.